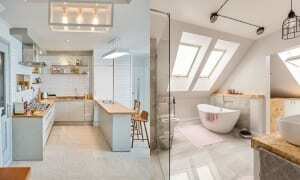 Modern Kitchen Ideas - Which? 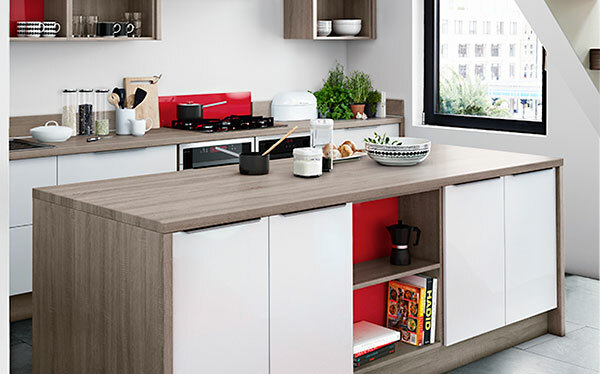 Our modern kitchen ideas will help you refresh your tired old kitchen or create a bright, contemporary new space. Whether you want to create an entirely new modern kitchen from scratch, or just want to update your current design, our gallery bellow is packed full of ideas. The kitchens shown are from B&Q, Ikea, Betta Living, John Lewis, Magnet, Wren Kitchens, Benchmarx, Homebase, Next and Howdens Joinery. See how well these brands were rated by their customers in our best kitchen brands guide. Not all brands did well - the highest scorer got a customer score of 90%, while the bottom got 56%. You can also find out which four brands scored highly enough in our survey to be assessed in our lab for a Best Buy. Three of them achieved Best Buy status. 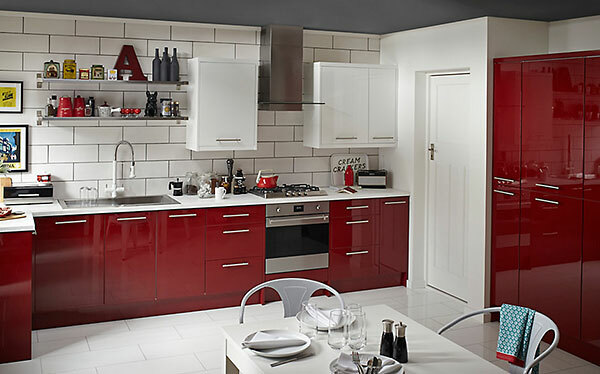 Bold colours are a great way to add the wow factor to a modern kitchen. A glossy, industrial or utilitarian splashback or tiles are ultra modern. Built-in appliances can create a stylish and sleek modern look. 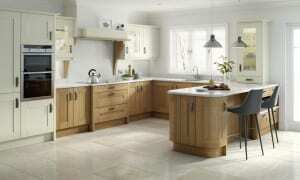 Dark or ash wooden kitchens look modern but warm. Distinctive flooring can create an impressive feel in a modern kitchen. Monochrome kitchens instantly give a modern look. High-gloss units will give a modern kitchen an added feeling of luxury. Be bold with your kitchen worktops to create a distinctive feature. Open-plan kitchens are great for creating a sociable modern space. 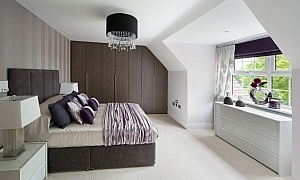 Curved units are a great way to create a sleek, modern look. Many kitchen companies supply colourful units or new doors in a range of shades and finishes, but you could also paint your current doors or create a feature wall for a cheaper update. See our guide to kitchen costs to work out how much you should expect to spend on a new kitchen, or to spruce up your current one. You can also find out the typical prices for the big-name kitchen brands, including B&Q, Ikea, John Lewis and Wickes. Starting at around £50 for a splashback and as little as 50p each for tiles (you would need around 100 to cover a one metre square area if the tiles are 10cm squared), both are a great way to modernise a new kitchen or spruce up an old design. From ovens to dishwashers and washing machines to fridge freezers, a lot of appliances now come as built-in, which can create a more streamlined, sleek look. Visit our kitchen appliances page to find the best for your kitchen, whether it's compact or open plan, as well as the size and price options. 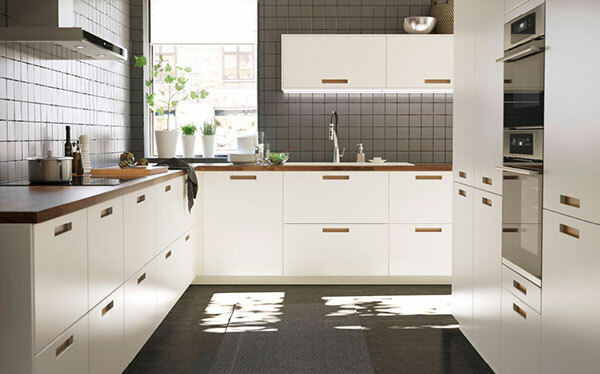 There are two styles of wooden kitchen that are popular for a modern look: dark wood (usually walnut) that shows the grain, and light wood for a fresh, Scandinavian feel. Wood veneer kitchens are a popular choice for either and cost less than solid wood. Our page on kitchen units, doors and worktops has more advice on the different materials available, and reveals which surface kitchen owners have rated better for standing the test of time. There are a number of flooring looks available, from expensive real wood to cheaper vinyl, which offers a huge range of style options such as concrete or stone effect. If you're interested in a wooden floor, take a look at our guide to buying wood flooring. Creating a black and white scheme is a simple way to bring a modern feel to your kitchen, and it can be done easily using paint and accessories, or by buying a new kitchen. 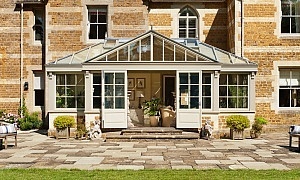 Many kitchens now come in a high gloss finish, and teaming this with glass-fronted doors will modernise your kitchen. But, if you don't want to buy a whole new kitchen, you can spruce up your current units with gloss paint, although this won't give quite the same sheen. A new worktop can be an inexpensive way to modernise your kitchen, depending on what type you want - granite and solid worktops can be the most expensive, from around £150 per square, and laminate worktops, which replicate a number of materials, from around £30 per square metre. Our page on kitchen costs has more information on how much it might cost, including labour, to replace and repair tired old worktops. If your space allows it, an open-plan layout will give an instant modern feel. See our guide to kitchen layouts for more ideas. Handleless doors and curved kitchen units create a sleek modern look, but these design details will cost a little more - handleless doors to replace your current ones start at around £10. Want to see the best and worst kitchen brands? 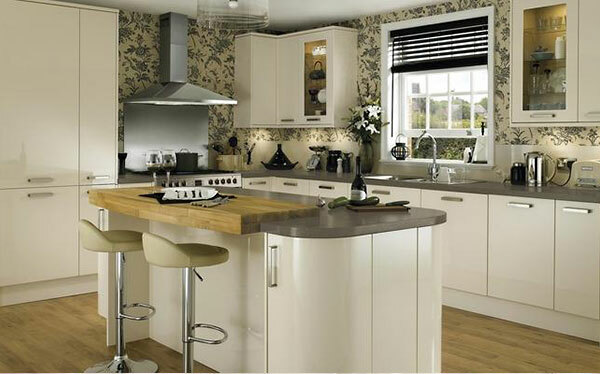 Find out which brand was rated highest by its customers in our fitted kitchens review.